We will meet at the tour hotel in the centre of Kyoto. There will be a Welcome Dinner at a local restaurant. Today we travel by train to Nakatsugawa, one of the old post- towns on the Nakasendo Trail. The original main road through the town retains its Edo-Period heritage with traditional sake shops, restaurants in period wooden buildings and old storehouses. We start our walk here and head towards the next post-town of Ochiai. From Ochiai we ascend through cedar forests and traverse a section of the trail whose cobblestones date right back to the Edo Period. 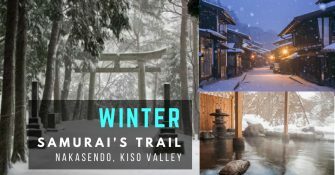 Over the next four days we explore the best-preserved portions of the ancient Nakasendo Trail through villages and hamlets, all set against the magical winter scenery. Our lodging tonight is a charming family-run inn in the post town of Magome. an afternoon to explore the many small shops along the picturesque main street with its lovely old wooden architecture. Try gohei-mochi, skewered sticky rice covered in a sweet paste of miso, sesame and walnuts. Tsumago is a living museum, which is still home to local residents whose families might have lived here for generations. We stay overnight in Tsumago at a family- run inn with a real sense of history. This morning we continue our exploration of Tsumago including a visit to the Wakihonjin museum housed in a building which dates back to the 19th century. Today’s walk begins after lunch and is a short but enjoyable stroll from Tsumago to Nagiso along country lanes. From Nagiso we board a local train for the brief journey to Kiso-Fukushima, a delightful post- town which was once an important Sekisho checkpoint on the Nakasendo. We stroll through the town before heading out to our comfortable Ryokan inn on the outskirts of the community. The Ryokan prides itself on its wonderful cuisine and its terri c indoor and outdoor thermal baths – a perfect way to warm up on a winter evening. at one of the small local restaurants. Our overnight accommodation is in Narai at a family-run inn in the village. to Matsumoto, a castle town nestled in the central alps region. We visit Matsumoto Castle, one of four castles designated as National Treasures of Japan before boarding a local bus to nearby Asama Onsen. The spa town has a history dating back 1,300 years and we stay overnight at one of the most elegant, authentic Ryokan inns, with beautiful wooden architecture from the Meiji era. the new Shiodome business area beyond. Next we visit Nihonbashi (the ‘Japan Bridge’) considered to be the ‘centre of Japan’ and the zero marker point for all Japan’s main roads since the Edo period. This is where the Nakasendo Trail would once have finished. In the evening, there is a Farewell Dinner with your guide.